InspirARtion is a free Windows 8 painting app that lets you turn photo to painting or create a fresh painting / sketch on your own. This sketching Windows 8 app has been designed for those who are not so good at sketching or painting (like me) but want to pursue it, just as a hobby. This painting Windows 8 app comes with a collection of amazing brushes in three different sizes (Small, Normal, Large), color palette, Symmetry modes (Vertical, Horizontal, Kaleidoscope). It’s very easy to create a professional looking painting on your own. InspirARtion is available under ‘Entertainment’ section of Windows 8 app store and you do not need to pay even a single penny to download it. Once you have created your painting, you can now save it to your local photo library or just share it with others using the integrated Windows 8’s Search Charm. 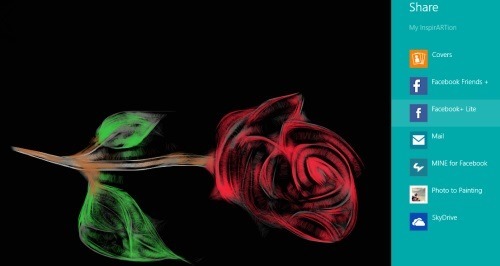 You can explore your hidden creativity with this Windows 8 painting app below. Let me quickly point out the features of InspirARtion Windows 8 app below. Brings you a collection of amazing brushes in different sizes. Contains an advanced color palette. There are three different symmetry modes: Vertical, Horizontal, Kaleidoscope. Lets you share your creation with others using Windows 8’s Share Charm. It lets you explore your hidden creativity. Lets you save your creation to your local picture library. Well.. I really found this painting app for Windows 8 interesting as it actually creates a realistic painting. However, when I was testing this app, I realized that the ‘Erase’ button is not working and hence you do not have any option to erase, if something has went wrong. The only option left with me was ‘Undo’ but then.. Undo button works to a limit. Nonetheless, if you a smart humor then you will probably be able to cover your mistake smartly, like I did . Also, check out our posts on Painting Apps, Rhymes Apps, and Facebook Client Apps. In order to install InspirARtion app in Windows 8, you need to open this link in IE10 and click ‘View in Windows Store’. Once you do that, it will open the app in Windows 8 store from where you can download it. It’s very simple to download. In short, InspirARtion app is a nice fun app and if painting or sketching is your hobby then it’s a must-have Windows 8 painting app. Go ahead and download InspirARtion app in Windows 8 now.